Think about getting your spider or varicose veins treated as the summer comes to an end. Some patients hide bulging, discolored veins on their legs by wearing pants. But they aren’t able to hide from the pain, swelling and intense itching these veins can cause. Varicose veins affect one out of two people over age 50. Luckily for them, advanced, minimally invasive treatments to reduce pain and eliminate unsightly veins have replaced old techniques of stripping or removing varicose veins through large incisions. Dr. Naoum offers same-day procedures that use the newest generation lasers, sclerotherapy or tiny incisions or pinholes to help erase unhealthy veins. The risk of developing venous insufficiency increases with age – especially for women – but younger woman can also develop the condition. 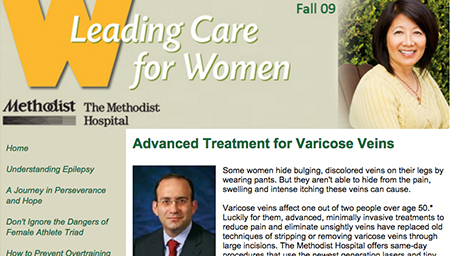 “Thirty percent of women ages 20 to 40 will have some form of varicose veins,” Naoum says. Untreated varicose veins typically enlarge and worsen. If varicose veins or venous insufficiency become severe, health problems may include pain in the legs, swelling and even skin sores. Naoum says varicose veins are typically not a life-threatening condition, but they can threaten the quality of daily life. “On top of a stressful day, varicose veins increase discomfort, burning and heaviness in the legs. We may not be able to prevent varicose veins, but we have found effective ways of taking care of symptoms,” he says. Conservative treatment begins with compression therapy or wearing medically approved support stockings. Naoum says horse chestnut cream has also proven to decrease swelling around blood vessels. Conservative treatment may help reduce discomfort; however, patients should also be tested for venous insufficiency. Naoum will obtain a venous duplex ultrasound test to detect veins that have faulty valves. If diagnosed, he offers a full range of comprehensive treatments including the most advanced version of combination therapies. “When patients return for follow-up, they are often extremely happy not just to be relieved of symptoms, but also that there was a relatively easy solution to their cosmetic problem too,” Naoum says.